I wish I knew where it came from! I love the lead separating the gray and green color! 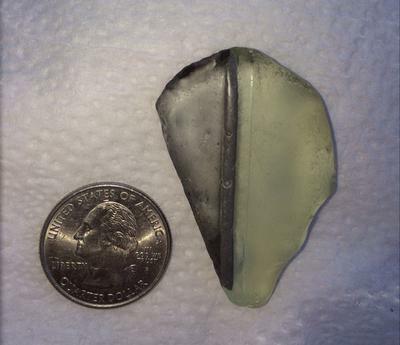 Possibly off a ship window? I don't have any suggestions at this time. Did you ever find what this piece came from? I have several of these as well and have no Idea what they are. So interesting and amazing! Thank you for sharing! If u ever find that pic, I'd live to see it! We found one similar to yours in Washington. We also wondered if it could have been from a big ship. Very thick glass. I'm sure we've got a picture of it somewhere but it's probably buried in the thousands of pics we have. Hopefully somebody will know what it might be.